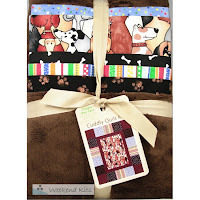 You'll find a new selection of easy sewing projects in the Sew It Kits section of the store. Sew a modern apron, stylish tote bag, or decorative pillowcase the easy way! We have 6 new Cut, Sew & Go! Fabric Panel Project Kits from Fabric Editions. These ready to sew kits make sewing quick, easy & fun! 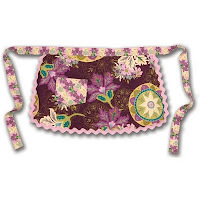 Create a modern reversible half-apron in a few easy steps. 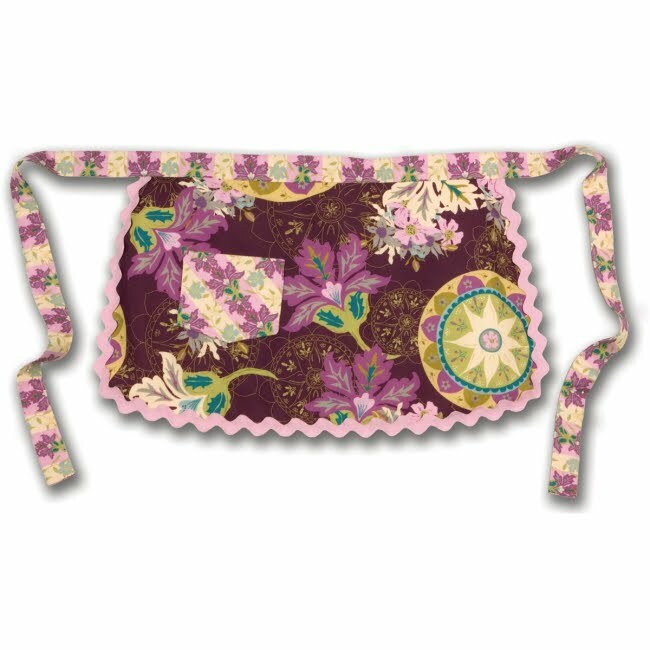 This fabric panel sewing kit includes a 36"x 57" cotton fabric panel, coordinating trim, and complete instructions. Fabric panel projects make sewing easy. The pattern pieces are already integrated with the fabric panel. This saves you the time of cutting out separate pattern pieces and pinning them to your fabric. With fabric panel sewing kits, you cut the pattern pieces directly from the 100% cotton fabric panel and sew them together in a few easy steps! 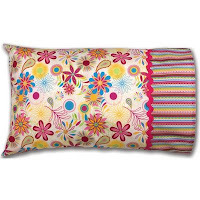 Create a decorative reversible pillowcase in no time at all. Fabric panel sewing kits are ideal for beginners. Simply cut the pattern pieces from the fabric panel, sew trim in place, stitch sides together, and hem! These simple sewing projects are suitable for adults, teens, and older children with some sewing experience. Create a stylish reversible tote bag with this quick & easy sewing project kit. 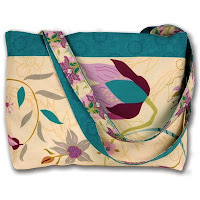 Use this versatile tote for carrying craft projects, books, groceries, baby supplies, and more. You'll need some basic sewing supplies on hand to complete your project, including a sewing machine, iron, scissors, marking pencil, thread, and general sewing notions. 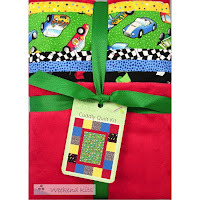 Fabric panel sewing kits are a quick gift giving idea for experienced sewers. Complete this tote bag project in just 1 hour! You'll find them all in the Sew It Kits section. Sewing is a fun way to spend leisure time and ready to sew kits make it easy to get started right away. Explore a variety of sewing craft kits at Weekend Kits and be ready to sew something new on your next Weekend at Home! Make sure to see our newest selection of kits in the Kid's Craft Kits section of the store. Kid's enjoy spending time creatively and kits make it easy to get started crafting! Kits make learning a new craft easy & fun! 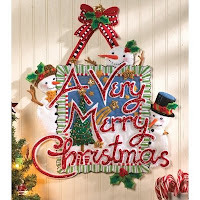 Learn-a-Craft Kits from Dimensions were designed especially for kids 8 years and above to learn counted cross stitch. The small size of these kits makes them an easy project for kids to complete. This is an ideal beginner embroidery kit for teaching kids cross stitch. In addition to learning cross stitch, this kit teaches children how to read charts and determine when to change colors. Kid's will be proud to display their finished needleart project. Kid's will enjoy the bright colors and fun patterns. 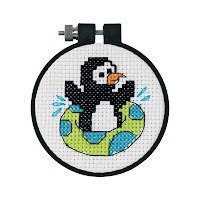 Choose from 3 counted cross stitch designs, including Perky Puppy, Cute Kitty, and Playful Penguin. 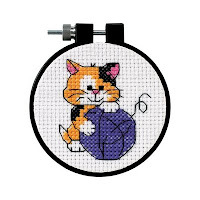 The hoop makes the perfect frame for the completed cross stitch design. Simply center the finished design in the hoop and it's ready to display! These mini embroidery kits include white Aida fabric, 3" hoop, cotton floss, needle and instructions. The only other supply you'll need to have on hand is a pair of kid's safety scissors. The Wooden Fashion Dolls Kit is a Decorate-Your-Own Craft Kit from Melissa & Doug. Kid's will have fun decorating their own fashion dolls using the materials in this kit. 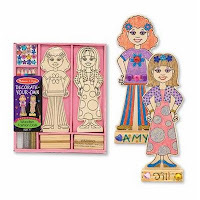 Kit includes 2 wooden fashion dolls, 2 wooden stands, glitter glue, craft glue, sparkling gems, and colored pencils. This is a fun party craft kit for kids ages 4 and above to decorate fashion dolls together! 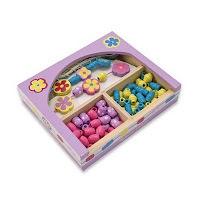 The Flower Power Mini Wooden Bead Kit from Melissa & Doug includes over 70 beads, 3 long laces, and a wooden storage box. The wooden beads come in a variety of colors, shapes, and patterns. Kid's will create one-of-a-kind jewelry to wear and share. The pretty wooden storage box is a convenient place to store finished jewelry pieces. This is a fun party craft kit for kids ages 4 and above to make their own jewelry together! Visit the Kid's Craft Kits section to see all of our creative project kits for kids, including embroidery kits, knitting kits, latch hook kits, scrapbook kits, and more! If you're looking for fun weekend & summer crafts ideas for kids, you won't want to miss DLTK's Crafts for Kids website. This is a quality site that is easy to navigate. The best part is that all of the activities on this site are free! You'll find a wide range of printable coloring pages, greeting cards, craft activities, and more. Learning new skills builds confidence. Explore a fun variety of craft kits at Weekend Kits and get the kid's ready to learn a new craft on their next Weekend at Home! We have some beautiful new cross stitch kits in the Embroidery Kits section of the store. Create a lasting keepsake for baby with these quality embroidery kits from Bucilla! Mother Goose is prominently featured in this beautiful lap quilt designed by Mary Engelbreit. 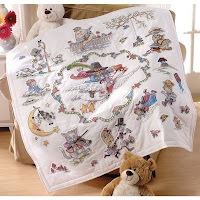 This stamped lap quilt design celebrates the classic collection of Mother Goose nursery rhymes with Mary's signature style, colors, and exquisite attention to detail. The kit includes a pre-stamped poly/cotton fabric top, cotton embroidery floss, floss separators, needle, instructions and chart. The fabric in this kit is not pre-quilted. After completing the embroidered quilt top, you'll use standard quilting techniques to complete your lap quilt project. Your finished lap quilt will be 45" x 45". 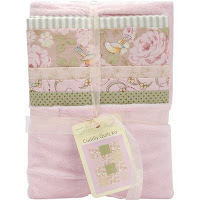 The Mother Goose nursery rhymes are brought to life in this wonderful quilted baby blanket kit designed by Mary Engelbreit. This stamped quilt kit includes fabric that is pre-quilted and pre-finished with the cross stitch design printed in washable blue ink. 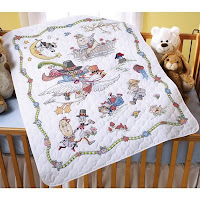 Once you've finished embroidering the cross stitch design, your baby quilt will be ready for baby's nursery! 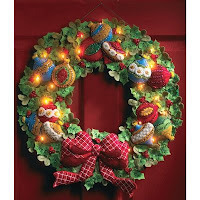 This kit also includes cotton embroidery floss, needle, and easy-to-follow instructions. Your finished crib cover will be 34" x 43". If you're decorating baby's nursery in a jungle or safari theme, you won't want to miss these new cross stitch kits for baby! 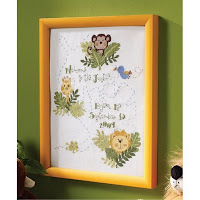 We have the complete In the Jungle collection of baby embroidery kits from Bucilla. This baby embroidery ensemble includes the In the Jungle Baby Quilt Kit, Birth Record Kit, and the Baby Bibs Kit. Visit the Embroidery Kits section for details on these kits and to see our complete selection of embroidery kits for baby. Visit Weekend Kits to explore creative project kits across a variety of craft categories and be ready to make something new for baby on your next Weekend at Home. New kits are being added to the store on a regular basis, so be sure to check back often!